Ford&#8217;s CEO is confident the auto industry will secure government loans. 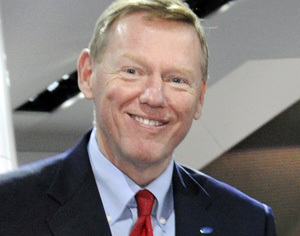 DEARBORN, MI – Ford Motor Co. is not seeking a government bailout, but rather a loan to help advance fuel-saving technologies designed to meet pending corporate average fuel economy regulations, says CEO Alan Mulally. Ford, General Motors Corp. and Chrysler LCC, along with industry suppliers, are seeking up to $50 billion in government loans, a provision featured in last year’s Energy Independence and Security Act. The government “included a provision in that bill last year for the financing of loans to the automotive industry, both the OEMs and suppliers,” Mulally says. In a recent interview with The Los Angeles Times, Chrysler Vice Chairman and President Jim Press echoed Mulally’s stance on the government-backed loans. The Energy Independence and Security Act calls for $25 billion in government funds to assist the industry, but auto makers are expected to lobby for more in Washington next week. Mulally declines to reveal whether he personally will be meeting with government officials but says asking for more than $25 billion is definitely a possibility. While an official decision has yet to be made on the federal loans, Mulally is confident they will be issued. Lawmakers are “deciding how to fund it, including what the specific amount should be and the criteria. We’re looking forward to working with the government on it.” he says, adding that the auto industry’s relationship with the federal government has improved over the last few years.